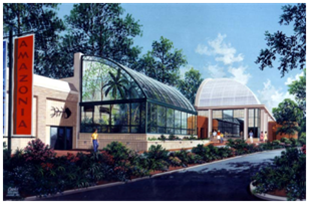 INTEC ultimately designed the Zoo’s piece de resistance: the Amazonia Science Gallery. This showpiece started as a small project and is now one of the most popular exhibits at the National Zoo. The Amazonia Science Gallery is located adjacent to the Amazonia Rainforest Exhibit-a re-creation of the Amazon environment, complete with birds and monkeys overhead, cocoa and avocado trees, and a river flowing through it. Bringing exhibits and teaching to a new level, the Amazonia Science Gallery puts the scientists on display. To accommodate both the scientists and the public, INTEC designed movable glass-fronted laboratories where researchers perform experiments in full view of the visitors and involve the public in the process. The design presented some unique challenges. 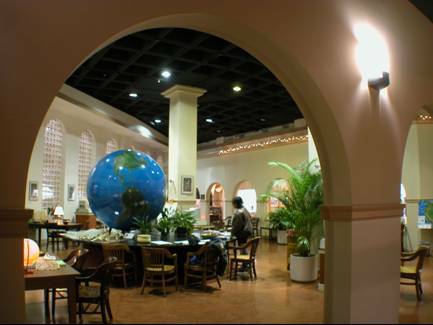 For example, because the building, a Spanish piazza, required a high ceiling to reflect the jungle ambience, the team had to save space and configure ductwork to fit inside the walls, not the ceilings. Miles Roberts, deputy head of the zoo’s department of zoological research, said that despite budget limits, “INTEC’s timely and creative ideas resulted in a product of almost undiminished quality. We are extremely satisfied with how ASG turned out, as are our visitors and colleagues. INTEC designed movable glass-fronted laboratories where researchers perform experiments in full view of the visitors.